Thyme is one of the most popular herbs and is a perennial which ori-ginated in Mediterranean countries-There are several species of thyme but the most widely used are the grey-leaved garden thyme and the green- leaved, lemon scented one. 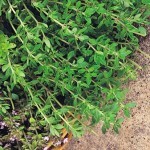 The garden thyme has a strong flavour and is excellent, used sparingly, in pates, soups, sauces and steivs. Lemon thyme may also be used in the above dishes and is especially good with veal.